After my post featuring Steak with Lemon-Cumin Pesto, I had about a quarter cup of the pesto left. That amount wasn’t enough to use to make another whole meal (like using it for a pasta sauce, for example), so I decided to whip up some sort of appetizer, finally settling on the Crostini you see pictured above. 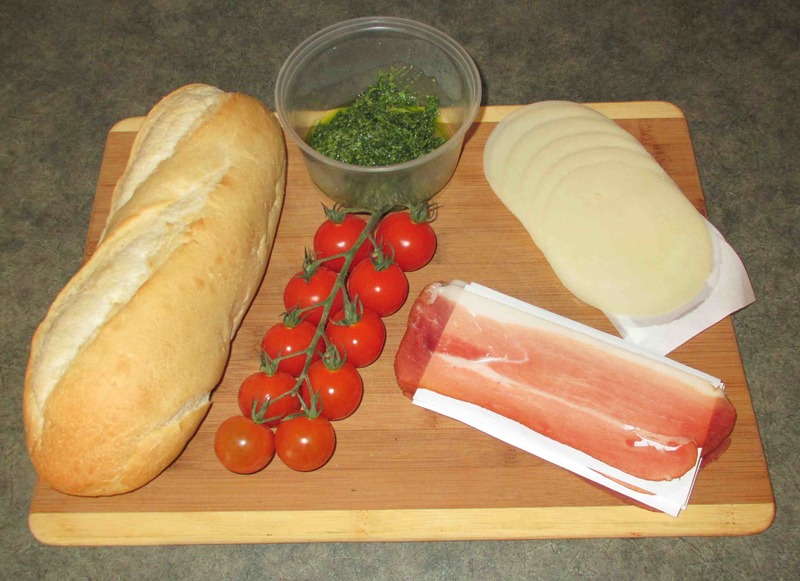 The ingredients, as you can see, are fairly simple and consist of nothing more than some nice crusty bread, the cheese, meat, tomatoes and my leftover Lemon-Cumin Pesto. I know cumin is not a typical Italian ingredient but there really wasn’t a lot in the pesto so I don’t think I am straying to far from Crostini’s traditional roots. If you don’t want to bother following my recipe, then any commercial pesto will likely work nicely instead. 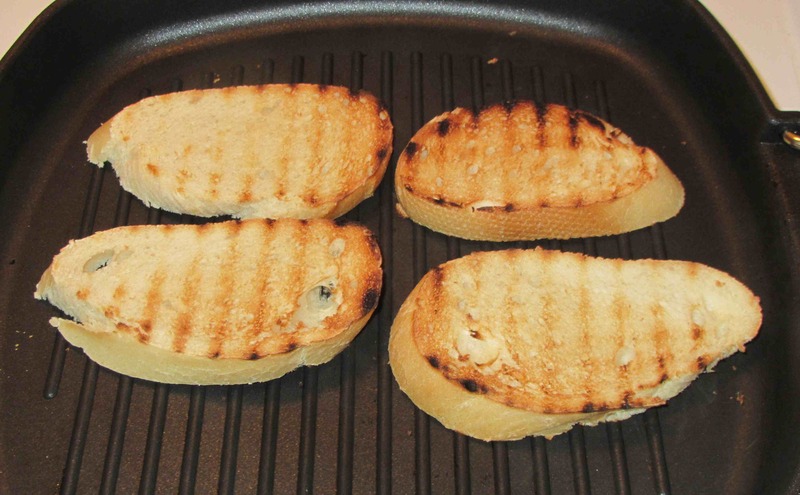 I would love to have a barbecue for this step, but my ridged pan actually does a nice job of ‘grilling’ the bread slices. Here are the slices of bread in two stages of the construction. 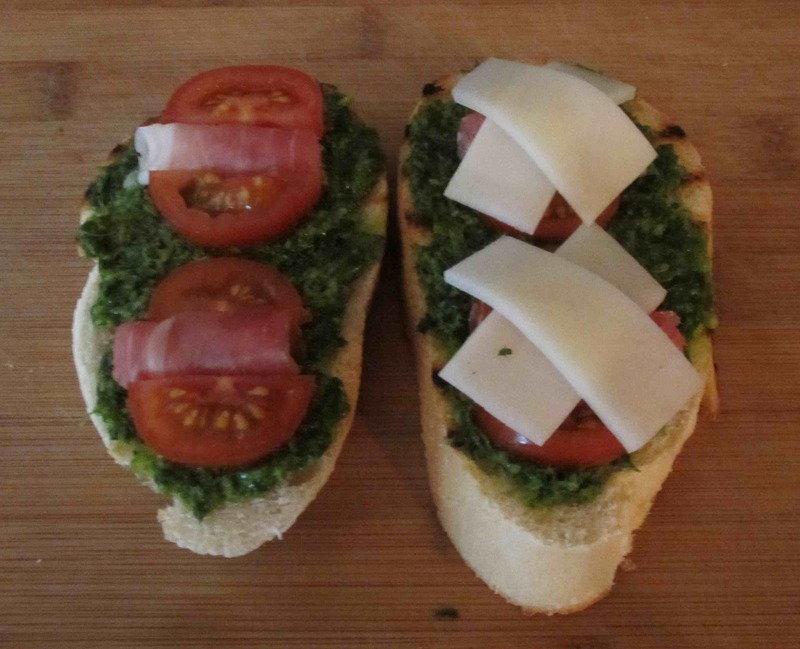 After grilling the bread, I spread the pesto on top and let it sit for a while. As I am not using butter or extra oil, I wanted the bread to absorb just a little of the pesto oil for moistness. I put some rolled Prosciutto on each slice, placed some tomato slices on either side and then covered everything with some crossed strips of cheese. After that, I popped them all under the oven grill for a few minutes until the cheese was melted. These are a gorgeous snack to have with family and friends. I was expecting the pesto to darken and look a bit unappetizing after being under the grill but the colour held up really nicely! I Love crostini and so do my hips! try making them with apples and walnuts and honey and fontina next. My wife would love those! Glad the experiment turned out successful! 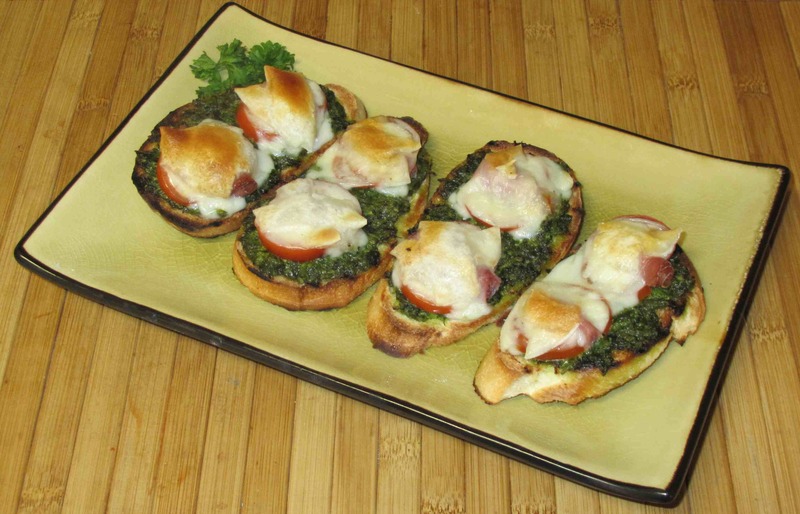 A great way to use up your pesto. And love the photographs. I would like one of those now as a midnight snack. That looks pretty wonderful. I love grilling bread just like that. Cute too how you nestled the prosciutto in-between the tomato slices. It’s like a tomato hug!!!! !